(Brussels) – Following their recent appointment, the members of the new Leadership Training Fund Team of the European Regions of the World Organization of the Scout Movement (WOSM) and the World Association of Girl Guides and Girl Scouts (WAGGGS) came together in Brussels this weekend for their first meeting. Also present were Corinna Hauri and Andrea Demarmels, chairpersons of the European Regional Committees of WAGGGS and WOSM, respectively. 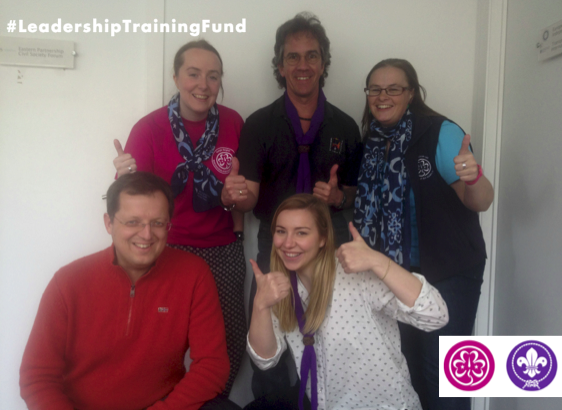 Set up in 2012, the purpose of the Leadership Training Fund (LTF) is to help bring together adult volunteers from across Europe in bi-lateral and multilateral training projects, as, increasingly, many Member Oragnisations of WAGGGS (MOs) and National Scout Organisations and Associations (NSOs/NSAs) are keen to learn from each other. Over the past 30 months, the LTF has helped provide the means to make this a reality for many. The new LTF Team – Louise Brown (IE), Thomas Ertlthaler (AT, chairperson), Sophie Hammermann (LI), Wolfgang Kniese (DE) and Jaime Sorrell (ES, vice-chairperson) – is now ready to make sure that the goal of the Fund is also achieved over the coming years. So, if your association wants to develop and run training activities in partnership with a National Scout Organisation (NSO) or Membership Organisation (MO) of at least one other European country, do not hesitate contacting the Leadership Training Fund Team. For more details about the LTF, please refer to information available on europak-online.net.